Two fantastic wines to pair with Robiola Bosina. The cow & sheep’s milk cheese with full & rich flavors that are earthy and mushroomy with undertones of sweetness and tanginess attributed to the sheep milk. For the red wine lover, De Forville Dolcetto d’Alba is simply delicious, with bright, juicy, red cherry fruit aromas and spice. The uplifting palate has dark cherry notes, a juicy mouthfeel and a pleasing finish. It adds enough bright acidity to cut through the creaminess & unctuousness of the Robiola Bosina. If sparkling is more your jam, grab a bottle of Savino Prosecco. This affordable bubbly is a classic match for the creamy texture of Robiola Bosina. The bubbles help cleanse the palate after taking a bite of this luscious, rich cheese. Quite delightful! If you’ve never paired your favorite wine with a delectable cheese, you’re missing out on one of the best flavor combinations in the culinary world. Whether you prefer a sweet Riesling or a dry Chardonnay, there’s guaranteed to be a cheese available that complements its profile. 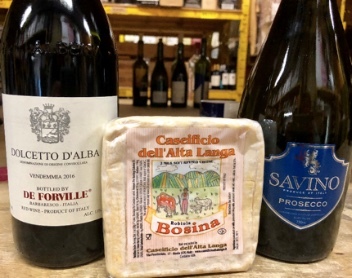 Next time you visit Acquistapace’s to buy a bottle of wine or a wedge of your preferred wheel of cheese, think about these pairings to enhance your experience. Port and Bleu – Port, a fortified wine that has a sweet taste and luxurious mouthfeel, is the perfect accompaniment to the pungent aroma and crumbly texture of blue cheeses such as Gorgonzola and Stilton. Chardonnay and Swiss – The bubbly mouthfeel of a great chardonnay pairs well with the nutty accents and hard textures of Swiss cheeses like Gruyere, Emmentaler, and Jarlsberg. Riesling and Ricotta – This dry, sometimes sweet, German wine is a polar opposite to this creamy Italian fresh cheese, but the combination is a match in heaven. Fresh mozzarella or goat cheese can be substituted. Pinot Noir and Brie – Pinot Noir is a very bold and flavorful wine that matches the creamy, delicate nature of Brie in brilliant ways. Feel free to use your Brie in appetizer dishes to fully enhance the combination. Malbec and Sharp Cheddar – Malbec, a full-bodied red from Argentina, creates a delectable flavor profile when paired with cheddars that have been aged to enhance their sharp flavor. Beaujolais and Feta – Beaujolais, a French wine made of Gamay grapes, is often referred to as a red that drinks like a white. This means it pairs well with the salty, crumbliness of feta. Light Greek wines also are an excellent substitute here. Rioja and Manchego – The nutty, complex flavors of a Spanish cheese naturally go well with the rich structure and tannins of this quintessential Spanish wine. Rioja is considered very similar to Cabernet Sauvignon. Pinot Grigio and Mozzarella – Pinot Grigio wine has a more dry, acidic taste to it so, pairing it with a soft cheese, like Mozzarella, tastes perfect together. Th opposite tastes with mellow the harshness. Other sweet cheeses, like Burrata and Gouda, pair well with the wine too. Sauvignon Blanc and Goat – The dryness of the Sauvignon Blanc white wine pairs well with the tangy taste of Goat cheese. You can substitute other tangy cheeses, like Beaufort and Brie, with the wine as well. 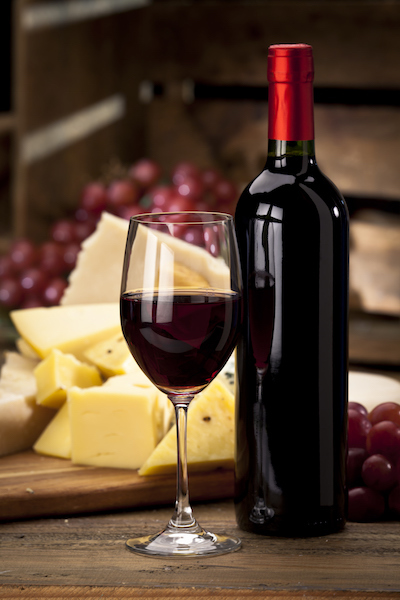 The friendly staff that works at Acquistapace’s has detailed knowledge of all types of wines and cheeses. If you’d like to learn more about great wine and cheese pairings available at our shop, call or visit us today.